The countdown to the maiden launch of Orion, a NASA space capsule designed to take astronauts out into the solar system, is now three months longer than previously planned. The space agency on Friday (March 14) announced that it was retargeting the first flight of its Orion spacecraftfrom autumn to just before winter this year. The EFT-1 mission will fly the Orion capsule to an altitude of approximately 3,600 miles (5,800 kilometers) above the Earth's surface, more than 15 times farther out than where the International Space Station (ISS) orbits. By flying out to those distances, NASA will be able to judge how Orion performs in, and returns from, deep-space journeys. Flying atop a United Launch Alliance (ULA) Delta 4 Heavy rocket, EFT-1 precedes the first flight of the Orion capsule on its intended launch vehicle, NASA's new Space Launch System (SLS), targeted for 2017. By 2021, NASA plans to send astronauts aboard the Orion spacecraft on a mission to the vicinity of the moon to rendezvous with a redirected asteroid, before ultimately launching a crew to Mars in the 2030s. For its first spaceflight though, the Orion capsule will carry instrumentation, rather than astronauts, on a mission that will help test out and refine the spacecraft's design. On EFT-1, Orion will re-enter Earth's atmosphere at a speed of more than 20,000 mph (32,200 km/h), returning to the planet faster than any current human spacecraft. As Orion returns to Earth, it will endure temperatures of up to 4,000 degrees Fahrenheit (2,200 Celsius), higher than any crewed craft since the Apollo astronauts came home from the moon. The Orion space capsule will then splash down in the Pacific Ocean off the coast of California, where NASA and Navy teams will be waiting to recover the capsule for study. Final assembly and pre-flight testing of the EFT-1 Orion is underway at Kennedy Space Center. Lockheed Martin, as NASA's prime contractor, is preparing the Orion inside the center's historic Operations and Checkout (O&C) building, which was used in the late 1960s and early 1970s to ready Apollo spacecraft for flights to the moon. According to NASA, almost all of the spacecraft's control or avionics components have been installed and, system by system, are now being powered. This functional testing will lead to performance tests, in which all of the systems work together to operate the crew module as a whole. Ultimately, engineers will turn on all of the Orion capsule's flight computers, radios and other systems simultaneously and simulate the vehicle's sensors so that the spacecraft thinks its flying in space. Testing of the EFT-1 Orion service module, a mockup of what on later flights will provide the spacecraft with power and in-space propulsion, was recently completed. The crew module's testing is slated to be finished in April, and then Orion's 16.4-foot in diameter (5 m) heat shield — the largest of its kind ever built— will be installed. With that in place, the crew module, service module and launch abort system will be ready to be mated this spring. The EFT-1 rocket is also coming together in Florida. The core and starboard boosters for the Delta 4 Heavy arrived at the Cape Canaveral Air Force Station earlier this month. The port-side booster, which is still being built in Alabama, is scheduled to arrive in April along with the rocket's upper stage for integration and testing. Despite the delay to December, NASA is still intending to have the complete EFT-1 vehicle ready by September. 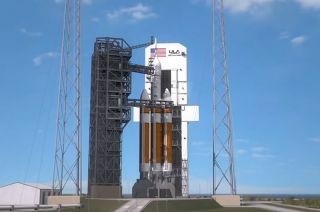 "Completing the [Orion] according to the original schedule will allow many engineers and technicians to continue ...to work on the Orion spacecraft that will fly atop the agency's Space Launch System," NASA said. "It will also ensure that NASA's partners are fully ready for the launch of EFT-1 at the earliest opportunity on the manifest." Though not stated by NASA, reports suggest that the slip to December was made to allow two recently declassified space surveillance satellites to launch before EFT-1. The Air Force's Geosynchronous Space Situational Awareness Program satellites will track satellites orbiting high above the Earth. Follow collectSPACE.com on Facebookand on Twitter at @collectSPACE. Copyright 2014 collectSPACE.com. All rights reserved.